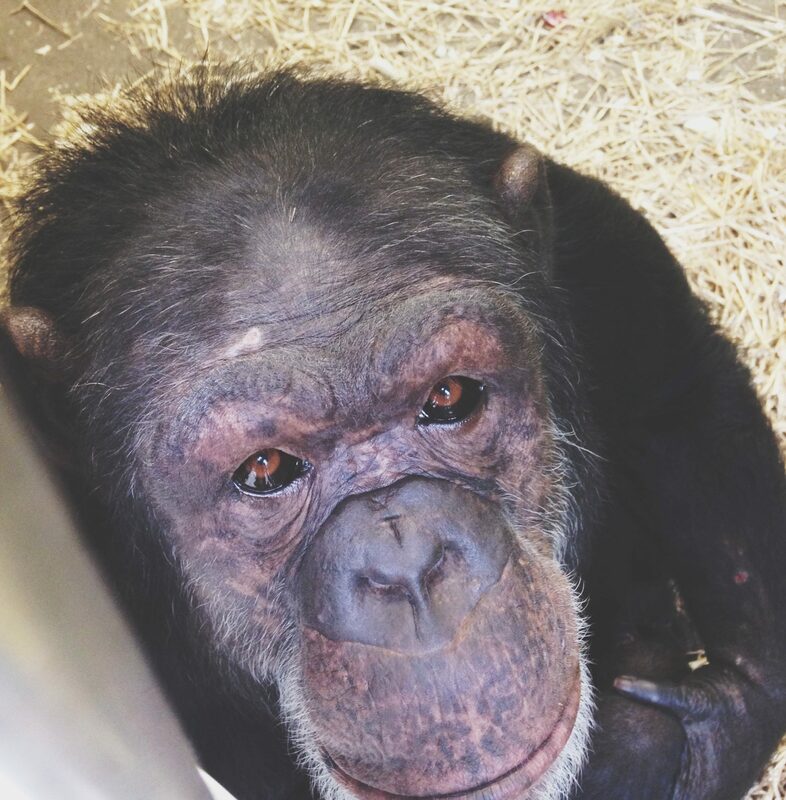 Celebrating our Beloved Friends: How we pay tribute to chimps who have passed away. The hardest part of caring for animals is having to say goodbye to them. When we take this job we know that death is an inevitable part of it, but that knowledge doesn’t make it any easier. Over the last year we have experienced our first chimp losses, which were some of the hardest losses we have ever endured. I am frequently asked what we do in the event of an animal death so I thought I would take some time to address that here, and give you a glimpse into that process. When our residents die we have them cremated, and we spread their ashes in our memorial garden. Before we do that, we like to take some time to reflect on their lives and the time they spent at the PRC. Each resident becomes a beloved member of the PRC family, and they are dearly missed when their time with us comes to an end. Our staff and volunteers like to take time to say goodbye to each individual and it is comforting to be able to return their remains to a place where they were cared for daily, and were so deeply loved. Our life’s work is to alleviate the suffering of primates, and it is an honor to be able to do that for the monkeys and chimps in our care. 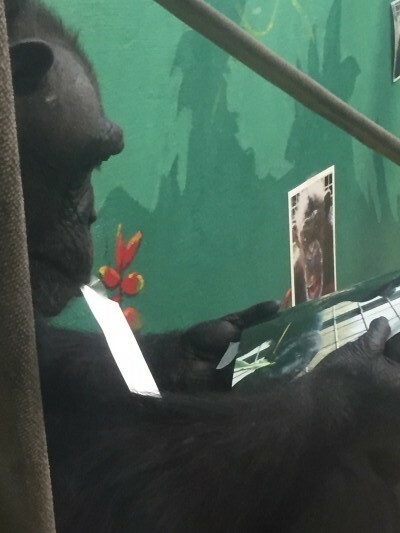 When we lose one of our chimps it is important for us to allow the other chimps to say their goodbyes and give them the chance to grieve over their loss as well. Both Hazel and Pozna died very suddenly after unexpected medical emergencies. In both cases, the chimp had been separated from the rest of the troop and our expert medical team was called upon for proper care. 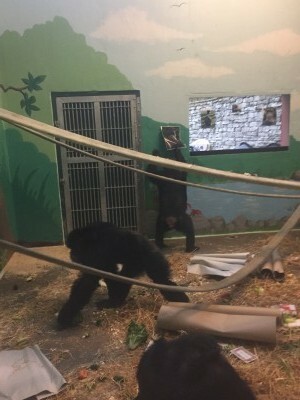 Since they were out of the enclosure, once they passed, we placed the body on a table outside of a section of caging so that the other chimps could see and touch their friend. In each instance some of the chimps became very visibly upset, while others just sat quietly and looked at their deceased friend. Some of them wanted to touch the hands and feet of their friend to try and wake them up, but once they realized they would not be able to wake them, they slowly started to leave the room. Some would linger for longer and even lay down beside the body, lightly touching their hands and feet. We have a fairly small group of chimps, so each loss is felt in a big way, and our chimps are greatly affected. 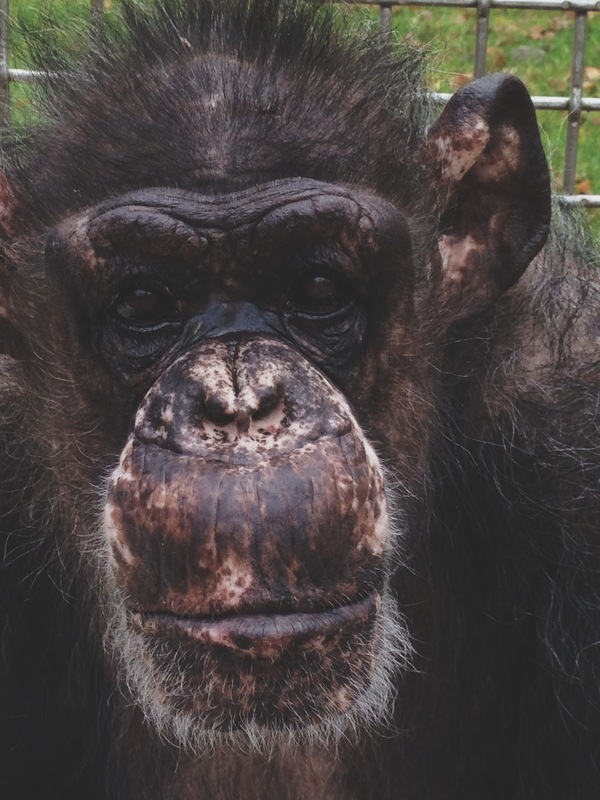 Another way we honor our lost chimps is by paying tribute to them on their birthdays. We go all out on the chimps’ birthdays and throw big parties with themes that we know the birthday boy or girl will really enjoy. 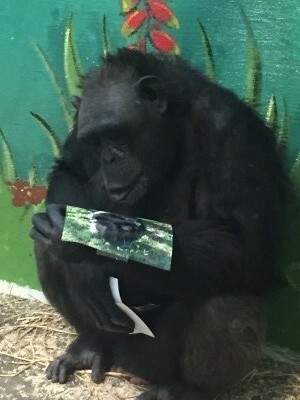 We still want to celebrate the chimps we have lost, so on their birthdays we throw a party for the group and place photos of our departed friend all over the walls and on posters so that the other chimps can see them and remember. It’s a small way for us to celebrate the time we got to spend with them before they passed, and a great way to help keep their memories alive within the troop. As caregivers we get to know our animals on a deep level, and we truly love each of the amazing animals that we have the honor of serving. It is nearly impossible to do this job without becoming emotionally invested, especially when working with primates who have very distinct and unique personalities. We know their favorite foods, favorite toys, games and even their favorite movies in some cases. We work hard to build trust and to work to restore some of what was taken from them when they were in labs or being kept as pets. That work naturally produces a bond, and it is very hard when we have to say goodbye. But with the pain of loss comes an immense amount of gratitude. We are forever grateful to have been a part of each animal’s life, and it is an honor and a privilege to care for them. Caring for them for the rest of their lives is our mission, so when that time comes and we get to the end of a life, we are able to grieve for what we have lost, but also celebrate what has been achieved – true sanctuary.